« Sawadee Kha from Thailand! Bangkok is impossible to cover in one day… there is just too much to do. 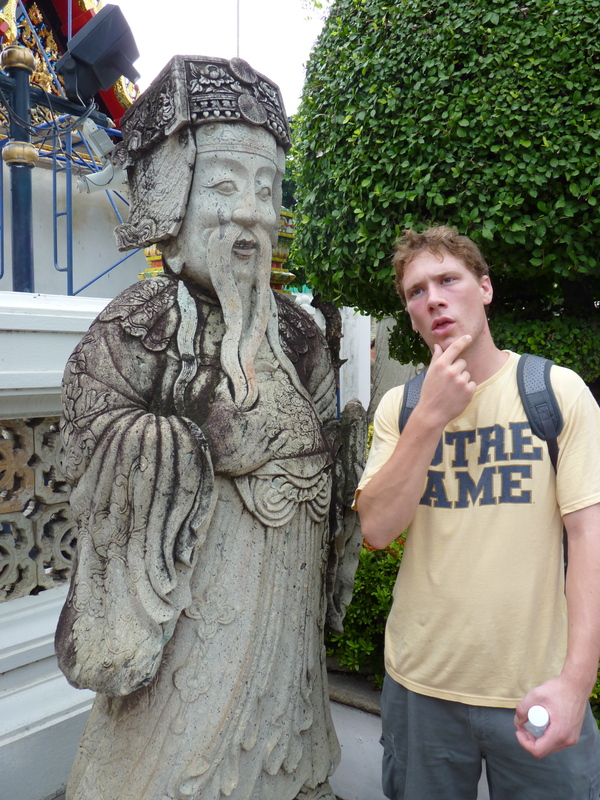 Saturday afternoon, Sean and I sat down and discussed what we wanted to accomplish on our first trip to Bangkok. After combining all of our ideas (markets, wats, restaurants, parks, museums, bike tours, etc), we quickly realized that covering more than a few neighborhoods at a time was simply impossible. Even with the very convenient Sky Train, which I might add puts the Chicago L to shame, we were not going to get to everything in one day. Our lack of a firm plan led us to have a wonderfully relaxing Sunday. Our taxi dropped us off at the Pinklao Bridge, in the neighborhood Banglampoo. Banglampoo is the home of the famous Khao San Road, known as the “backpackers haven” of Bangkok. This area is filled with bars, tattoo parlors, used bookstores, markets and guesthouses. Surprisingly, Banglampoo is also the home of the National Gallery. Both lovers of the Art Institute of Chicago, we immediately found a café, ordered song café rorn and made a plan of how to end up at the National Gallery. However, we never made it into the gallery, as there was a 200B entry fee per person. I wont even tell you how many USD that comes out to be, but once you start thinking in Baht, that seems pretty pricey. This turned out to be a blessing in disguise. We stumbled upon a small weekend art market where a number of artists were showing their art. Not only did we get to browse through some incredible paintings and meet a few artists, but we also walked away with 12 small paintings (totaling 200B- half of what we would have paid). What a Treat! At this point, it was 2pm and we were both starving (for an American meal). Thanks to Nancy Chandler, we found Ricky’s Café. One thing that Sean and I have got down to a science is ordering at a restaurant… the rule is order different things and share everything. This experience was no exception. We devoured a chicken mozzarella pesto sandwich and a grilled eggplant and feta salad (with homemade balsamic vinegar- I was in heaven). We finally made it to Wat Pho by river taxi. This was my third time at Wat Pho and I swear that each time it is more brilliant than the last. This compound is full of miniature pagodas, ornately decorated with colorful tile and gold. 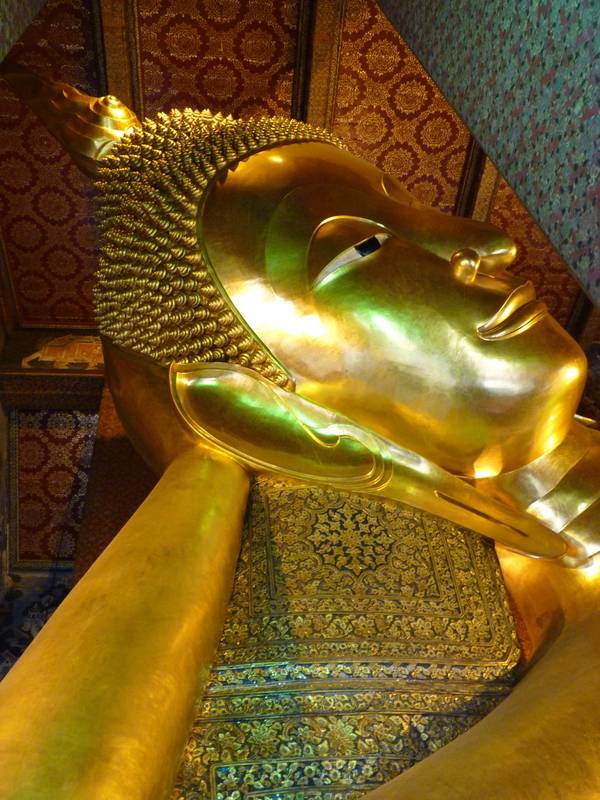 But even the brilliance of these cannot compare to the enormous reclining gold Buddha. This Buddha is like nothing you have ever seen before, at 46 meters long and 15 meters high, you can barely get the entire body in one picture. Definitely a must-see if you ever make it to Bangkok (even more so than the Grand Palace). It was getting late and starting to drizzle. We grabbed two large Leo beers with straws and walked to the river for a 30-minute riverboat ride down the Chao Phraya. What a great way to end the day. 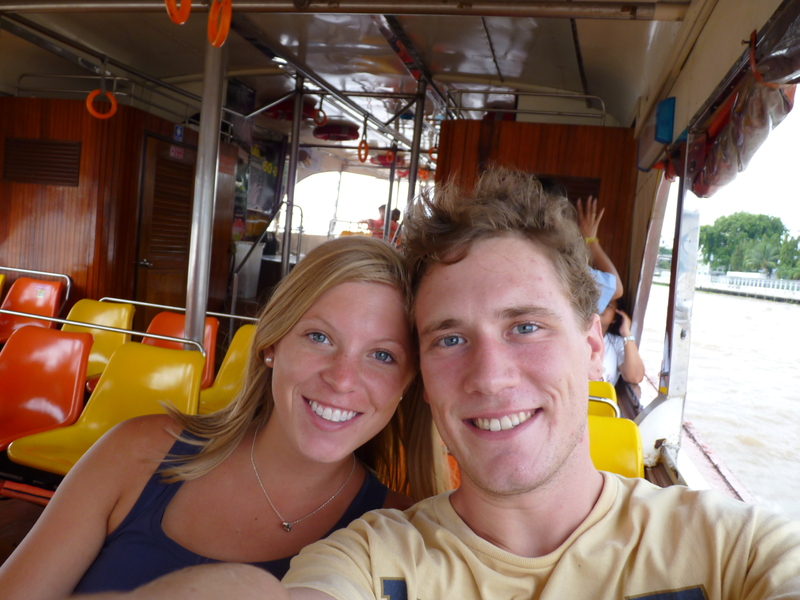 You took me back to last year at Wat Pho and the river boat! Sounds like a great day…the best ones come when you ditch the plan and turn a new corner!